The new Five Ten Hiangle (which won't give you the infamous "smurf feet" like the previous versions) is described as "the most comfortable" of Five Ten's downturned shoes, with an all-round performance that is relaxed enough for all day climbing, yet aggressive enough to tackle steep, overhanging routes. The Hiangle utilises Five Ten's Stealth® C4™ rubber, a thicker application than many of their downturned shoes (4.2mm) which give it the stiffest profile and a supportive feel of the foot, whilst still maintaining an aggressive line, perfect for the versatile climber who wants a shoe that will perform on a variety of different mediums with a balance between comfort and performance. The unlined leather upper will stretch about a half-size and the single Velcro closure is designed for comfortability and ease of access. C4™ performs well both indoors and outdoors by blending friction and durability, and has exceptional edging performance. Due to the rubber I'm a true fan of 5.10 and I've tried a lot of their models. Mostly I fought a bit with their shapes and heels. I have to say, finally, Hiangles are the best I've ever tried. Now i have the third pair in a row. As a slippers are more stiff, but overall I would appreciate it as moderate stiffness. They will stretch quite soon. I have a normal size of 42 and I wear 41 hiangle. The first impression is that they are very tight but really stretch and shape nicely according to the foot. Precise for leg work. Soon they are comfortable. C4 Rubber sticks perfectly but quickly disappears. This is the first handicap. The second handicap I see a shorter Velcro tape. Anyway, in my opinion, they are an excellent universal climbing shoes for bouldering, sport climbing, multi-pitches but also indoor. No need for two pair of shoes! For years I have always carried two pairs of shoes with me: usually one par of Sportivas and one pair of 5.10s. I kind of had my favorite "toehooking" shoe and my favorite "heelhooking" shoe or my favorite "steep" shoe and my favorite "vertical/slab" shoe. There was always a compromise. With this pair of shoes things have changed: no need for two pair of shoes! Hiangles have everything I need, all in one! Plus, with this version you don't get bue feet -- perhaps the only (valid?) complaint I've heard so far. A weapon for the block. The Hiangle are the slippers that match my expectations, asymmetrical, arched while keeping a good flexibility. They are like a second skin. The rubber adheres well and protects the entire foot for counter-tip. The point could be finer, but it remains very precise, allowing a edging in slope, as in slab. The slipper relaxes a little when done, allowing great flexibility for slab and vertical adhesion. The heel is well maintained, and is very powerful, it can be forced on without any hesitation. The slipper goes back relatively high (it can be a little painful the first time). This is a real fighting weapon for the block ;) which remains equally effective in difficulties. In addition this new model does not fade more like the old ones. Les Hiangle sont les chaussons qui corresponde à mes attentes, asymétrique, cambré tout en gardant une bonne souplesse. Ils sont comme une seconde peau. La gomme adhère bien et protège l'ensemble du pied pour les contre pointe. La pointe pourrait être plus fine, mais elle reste très précise, permettant un grattonage en dévers, comme en dalle. Le chausson se détend un peu lorsqu'on les fait, permettant une grande souplesse pour les adhérence en dalle et en vertical. Le talon est bien maintenu, et est très puissant, on peut forcé dessus sans aucune hésitation. Le chausson remonte relativement haut (ce qui peut être un peu douloureux les première fois). C'est une véritable arme de combat pour le bloc ;) qui reste tout aussi efficace en difficultés. De plus ce nouveau modèle ne décolore plus comme les anciens. I can now understand why so many people use these shoes. 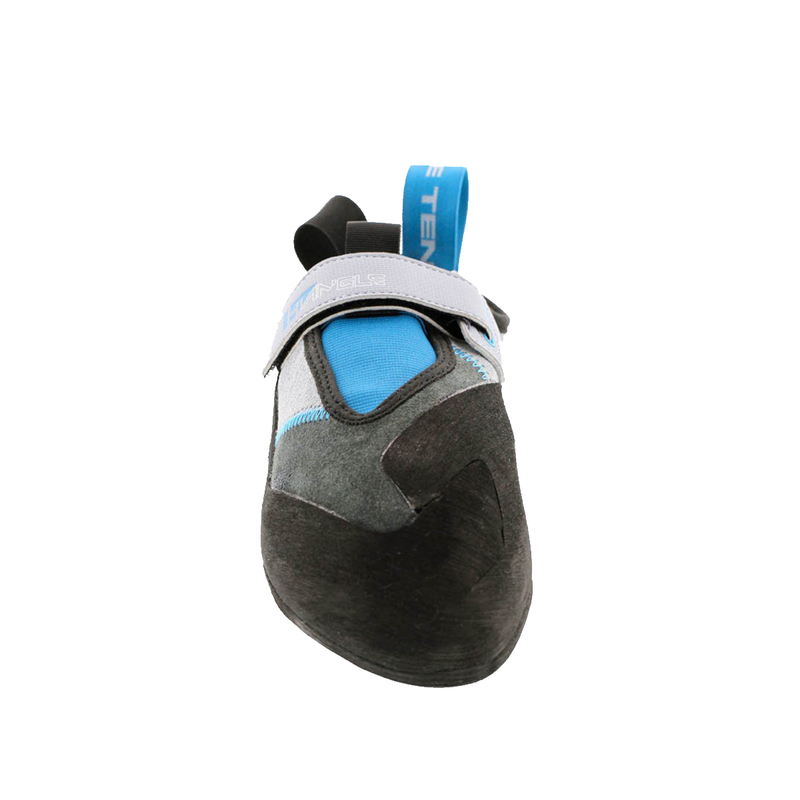 I have been climbing with Five Ten shoes for a while now and love the Teams, however, they can fall short on vertical climbs, but this is where the Hiangle shines. 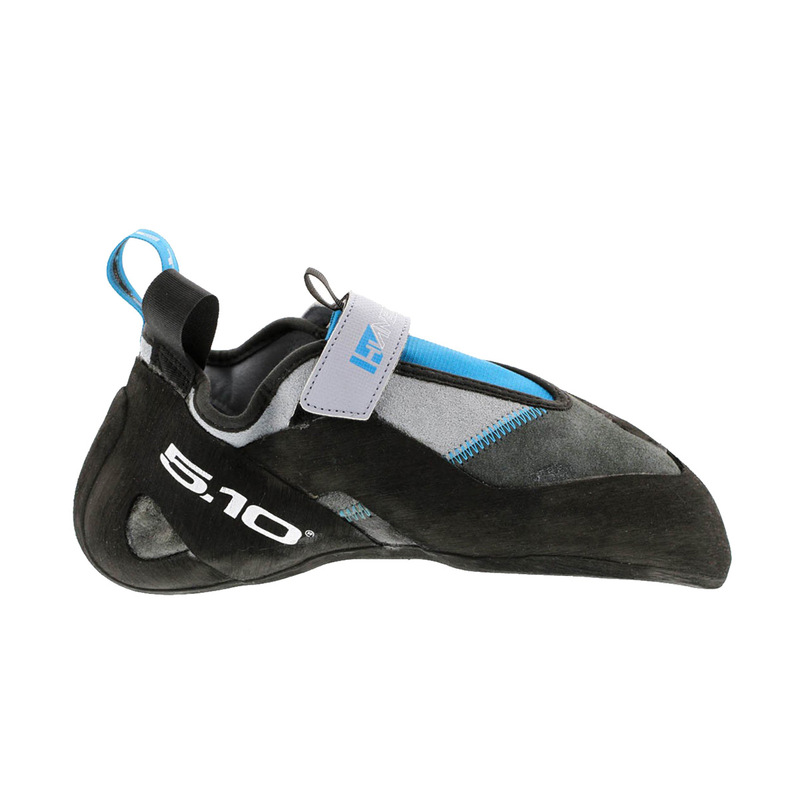 These are probably the stiffest shoe that Five Ten makes, however, they do not feel as stiff as Dragons for example. This is because the forefoot is very stiff, but the heel and midsole are much softer. The overall fit is very similar to the Team, but they have a lower volume heel and are slightly wider. They also stretch more than other Five Ten shoes due to being leather. 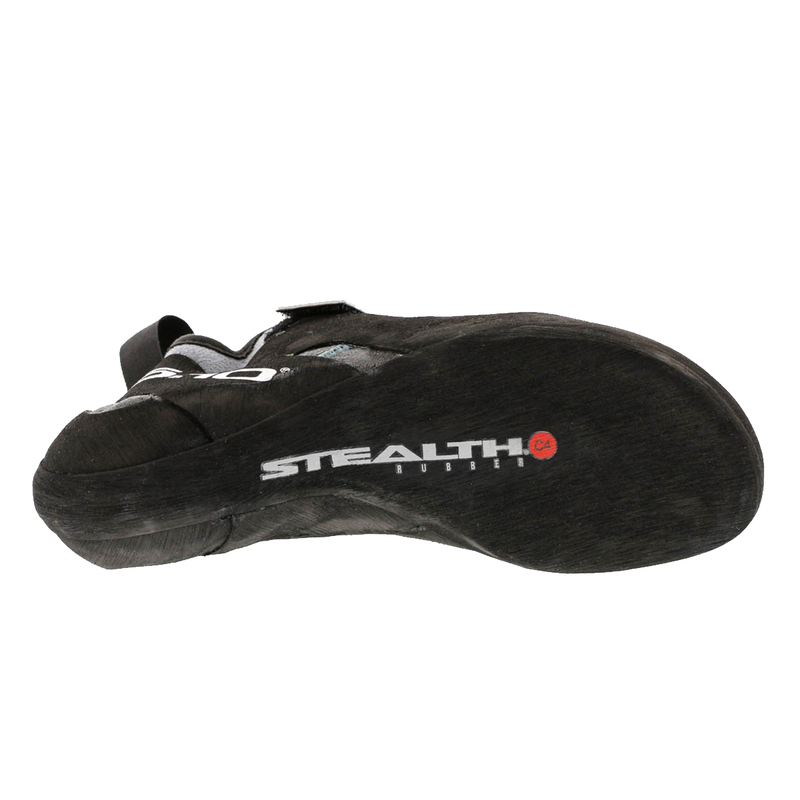 I use these primarily for sport climbing and boulders with small in cut feet and they work perfectly. As for sizing I have these in a size 42 and my street shoes is 43. This gives an aggressive fit but, still allows for the ability to smear and allows the stiffness of the shoe to do a lot of the work. I wear size 43 in Dragons and Teams, 42 in Arrowheads. With La Sportiva I used to wear 40 in Solutions, 39.5 in Pythons and 40 in Tenaya Iatis and Oasis. So I absolutely love these shoes, however they are not perfect so I will give my opinion on up and down sides. I have been climbing for ten years and have gone through five or six different shoes before I settled on katana's for a few years before switching to these. These shoes fit me great. I have a wider foot so for people with slender feet try the woman's version or find a different model shoe... One annoying feature of these shoes is that the opening is very narrow. Since they stretch a lot you need to fit them very tight when new meaning you might need to resort to plastic bags to get your feet in initially. 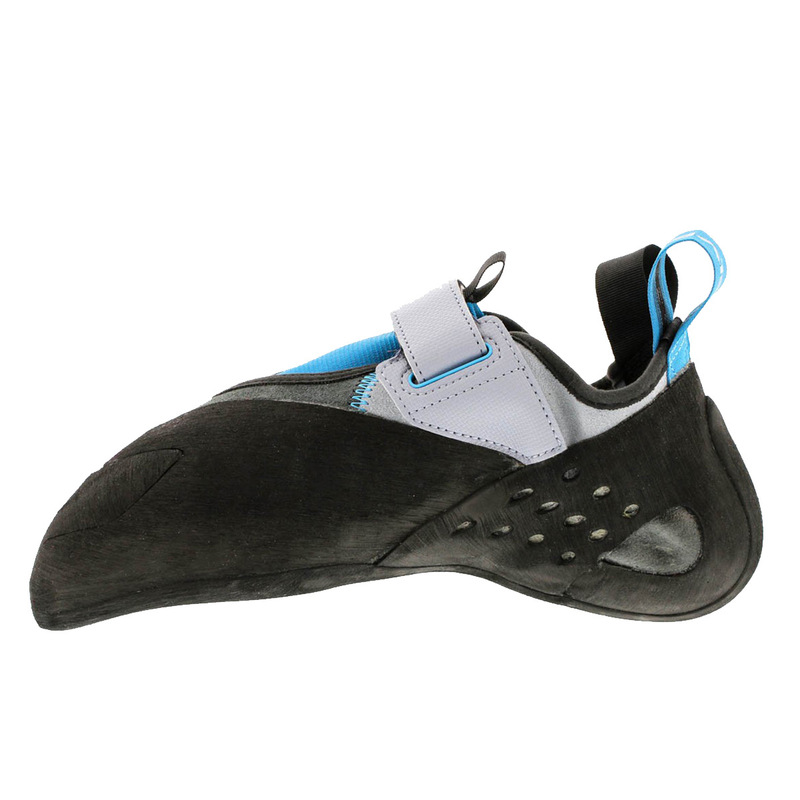 They are relatively stiff for a slipper which is great for heavier or intermediate climbers. Once worn in they are extremely comfortable for me without sacrificing performance. The rubber is quite durable. However the rubber doesn't feel as grippy to me as the la sportiva rubber I was used to. The rubber is also quite thick under the toes, so sensitivity is not the best. I also find I start slipping off smaller holds due to the rounding off the nose even if there is still a lot of rubber left. I attribute this to the harder rubber. (or my technique. But with the katana's I could climb until the rand came through the rubber so I count this as a disadvantage). Now we get to the good part, how do these shoes climb? 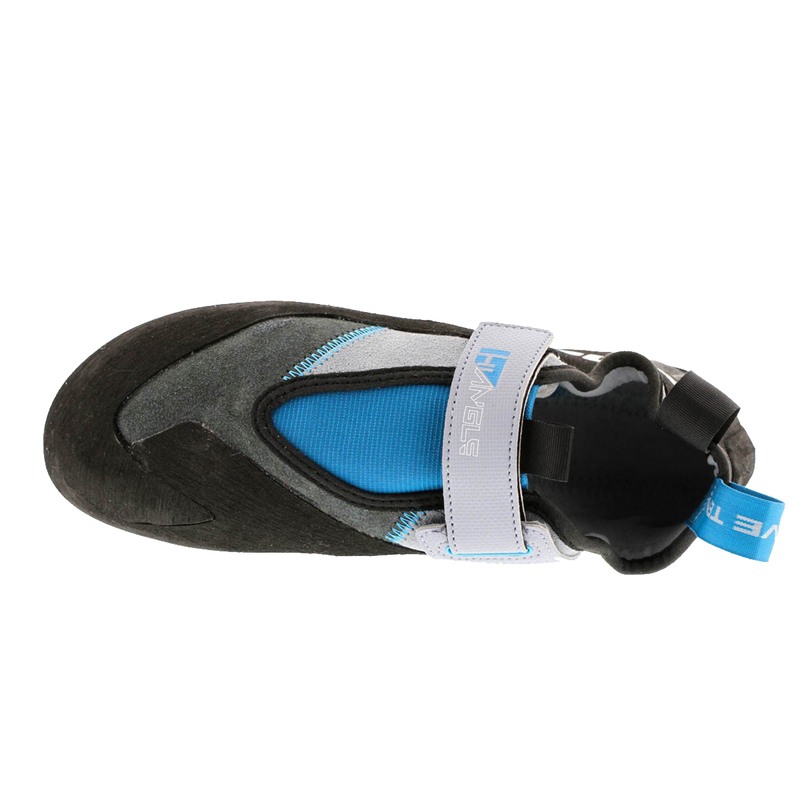 I am a big fan of steep bouldering and love these shoes for that. The heel of the shoe goes quite for up. This is in part reason it is harder to get into these shoes but it does mean you can heelhook with confidence the heel will not slip. There is also plenty of rubber on the toebox allowing for all kinds of technical wizardry. On overhanging terrain the slight downturn and stiff sole makes for great edging. So if that's what you're into, you might love these as well. I also tried them on some slabs in Fontainebleau. If you can find a tiny edge your okay, but for proper smearing they are definitely not the best. So they don't work everywhere, but they are great for 95% of my climbing and they also no longer give you smurf feet since they switched to a grey lining.